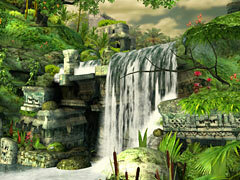 Take a journey into the deep jungle, where a picturesque waterfall lies near age-old ruins of a Mayan settlement. Enjoy the magnificent views and listen to the soft music, pacific sounds of the wildlife and murmuring water. An amazing scene of color and vaporous mists – tranquility for download. Fill your screen for Halloween with a haunting display with this hair-raising wallpaper.